George W Bush personally stopped an inquiry into a controversial programme to monitor the phone calls and e-mails of Americans, a top official has said. Attorney General Alberto Gonzales said internal investigators wanted to look at the role justice department lawyers had played in drafting the programme. Mr Bush had refused them security clearance, Mr Gonzales told senators. A White House spokesman responded by saying the programme was reviewed regularly, including by Mr Gonzales. The National Security Agency's eavesdropping programme was set up in the wake of the 11 September 2001 attacks. It allows the authorities to monitor international phone calls and emails if links to terrorism are suspected. Agency as a whole is so secretive its initials are said to stand for "No Such Agency"
It has proved highly controversial as the Bush administration maintains that the monitoring of phone calls and e-mails originating or ending in the US is legal and does not require a warrant. This is disputed by a number of lawmakers and civil rights groups, who argue that President Bush is exceeding his powers by ignoring the provisions of the Foreign Intelligence Surveillance Act. This stipulates that intelligence-related eavesdropping inside the US requires a warrant. Mr Gonzales's comments came as he was questioned by members of the Senate Judiciary Committee. He said the Department of Justice's Office of Professional Responsibility (OPR) had to call off an investigation into the conduct of department lawyers because it was denied access to classified documents. "It was highly classified, very important and many other lawyers had access. Why not the OPR?" asked Sen Arlen Specter, who has been leading calls for a court review of the eavesdropping programme. 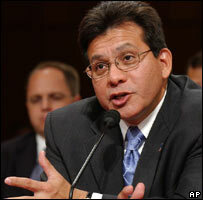 "The president of the United States makes decisions about who is ultimately given access," Mr Gonzales replied. He added that he was confident the programme's constitutionality would be upheld in a proposed court review. White House spokesman Tony Snow later said that since the programme was highly classified, Mr Bush approved all requests to review it. "There was a proper channel for doing legal review, and, in fact, a legal review was done every 45 days and the attorney general himself was involved in it." Mr Snow said the OPR, which conducts possible ethical abuses by justice department lawyers, was not the proper venue for conducting a review. The president's view was that the number of people exposed to the programme had to be restricted for reasons of national security, Mr Snow said.